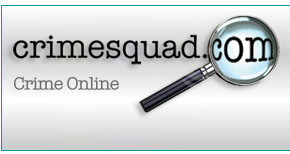 CRIMESQUAD.COM was thrilled to be invited to the Grosvenor House Hotel in Park Lane to attend the recording of the second Specsavers ITV3 Crime/Thriller Awards in association (for the first time) with the Crime Writers Association 'Daggers'. It was, in fact, the lovely Margaret Murphy, Chair of the CWA, who invited us... so many thanks for that! The addition of the CWA ‘Dagger’ element certainly spiced up the event compared to last year’s mix and there seemed a broader variety of styles of awards. The literary being mixed-up and joined with more TV-friendly awards for Best TV Series (Red Riding), Film (Gran Torino), International TV (The Wire), Actor (Dominic West) and Actress (Juliet Stevenson). The literary awards appeared to be generally well received, although there were still a couple that clearly puzzled audience members 'in the know'. Awards tend to breed that stuff! The big question - who judged each award, and on what criteria? – was, once again, sadly, left unaddressed. Winners podiums - and Perspex encased ‘Daggers’ - went to Johan Theorin (CWA John Creasey (New Blood) Dagger), John Hart (CWA Ian Fleming Steel Dagger), William Broderick (CWA Gold Dagger). Based on a public vote the ITV3 Bestseller Dagger was presented to Harlan Coben and four illustrious authors were inducted into the ‘Hall of Fame’ – Val McDermid, Lynda la Plante, Ian Rankin and Colin Dexter. For all the glitz, razzle-dazzle and drama, this event can only highlight the ever-increasing awareness, quality and diverstity of the Crime and Thriller scene. The CWA are to be congratulated for supporting this forward-looking move. 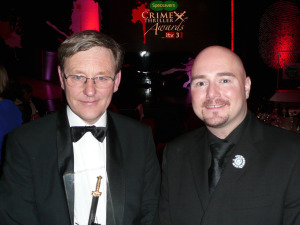 Picture below shows William Broderick, winner of the CWA Gold Dagger, with Chris Simmons (Online Editor of CRIMESQUAD.COM). 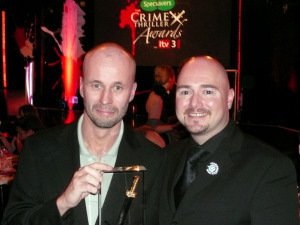 Picture below shows Johan Theorin, winner of the CWA John Creasey (New Blood) Dagger, with Chris Simmons (Online Editor of CRIMESQUAD.COM). Picture below shows Val McDermid (Hall of Fame), Juliet Stevenson (Best Actress) with Chris Simmons (Online Editor of CRIMESQUAD.COM). 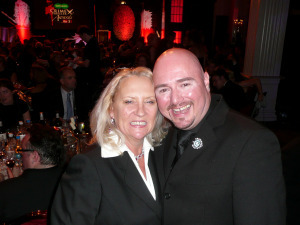 Picture below shows Martina Cole with Chris Simmons (Online Editor of CRIMESQUAD.COM). 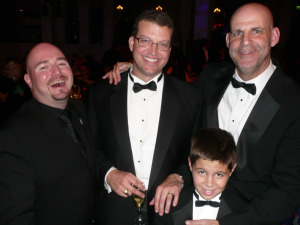 Picture below shows John Hart (CWA Ian Fleming Steel Dagger), Harlan Coben with his son (ITV Bestseller Dagger) with Chris Simmons (Online Editor of CRIMESQUAD.COM).